In my last post, the slots for the Spanish Heel joint had been marked onto the neck blank of the parlour guitar. The next task was to cut those slots ready to accept the guitar sides and the wedges which will hold the sides in place. This is the specific operation for which I ordered my Bad Axe carcass saw earlier this year, as I wanted a saw which would make precise cuts which needed little clean up. The saw performed perfectly, cutting through the steamed pear swiftly but retaining control and precision, so that the cut stopped bang on the baseline. Having cut a little inside the layout lines, the waste was knocked out with a mortise chisel and mallet. The most important, and painstaking, part of cutting the heel slots is paring the walls of the slots back to the layout lines and truing them so that the walls of the slots are perfectly straight long their length, and vertical. 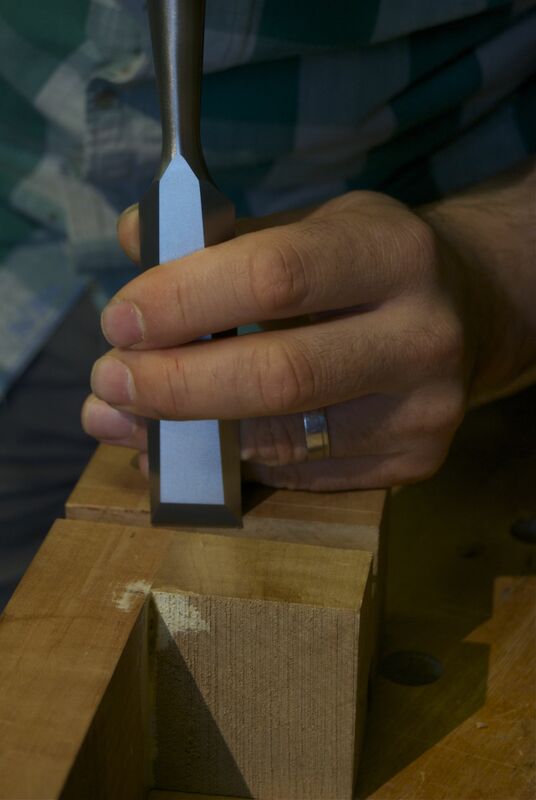 To do this I use a 1″ chisel with the fingers of my right hand wrapped round the handle, my thumb pressing on the end of the handle, and my left hand pulling the blade of the chisel into the slot wall to maintain a vertical cut. I start by removing half of the waste material along the length of the slot, then half of what remains, then half again, until the chisel is sitting in the kerf of the marking knife line. Once the chisel is sitting in the marking knife kerf, I pare half an inch at the end of the slot to true. I then work along the length of the slot, using half the width of the chisel, with the other half registering against the wall of the slot already pared to true. This prevents a bulge or a hollow developing along the length of the slot. To check that the slot walls are straight in both directions (along the length and depth) I use a simple mahogany wedge which has been planed flat along two edges. In Totnes we used a metal wedge shaped straight edge, but I have been unable to find anything similar in the past 7 years (if any readers know where a straight edged wedge can be purchased, please do let me know). Any final tuning of the slots can be done with chisel, and a fine rasp (I use a 7″, 13 grain Auriou modellers rasp). The slots are now at their final depth and shape, and are ready for the sides and wedges to be fitted when the guitar is assembled. The next work on the parlour guitar will be shaping the heel, and installing the truss rod, both of which I will cover in future blog posts.